European leaders and communities are speaking out and taking steps to fight growing anti-Semitism campaigns in the region. This is in response to the growing number of attacks that have targeted the Jewish communities since the Israel-Gaza conflict erupted, Israel National News reported. Threats like "Death to the Jews" and "Gas the Jews" have circulated in European countries like Belgium, France, and Germany in recent months. There are records of violence in many parts such as the killing of four people at the Jewish Museum in Brussels, destruction of a Jewish-owned pharmacy in Paris, attacks on a synagogue in Germany, and many others. Because of the attacks, an increasing number of Jews are now migrating to Israel, The New York Times reported. 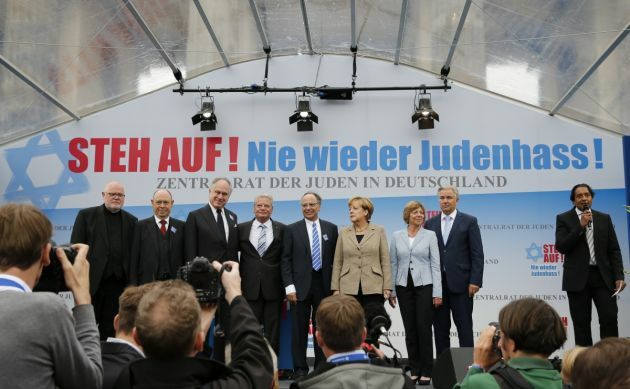 European leaders have strongly condemned the violence against Jews. Chancellor Angela Merkel of Germany, earlier this month, led a rally against anti-Semitism and told the Germans it is their duty to fight it. She declared before thousands of people, "Anyone who hits someone wearing a skullcap is hitting us all. Anyone who damages a Jewish gravestone is disgracing our culture. Anyone who attacks a synagogue is attacking the foundations of our free society." French Prime Minister Manuel Valls spoke to more than 1,000 representatives of the French Jewish community assuring them that fighting against anti-Semitism is a "national cause." "To be a Jew, to be French, French and Jewish identities are inseparable,'' he said. The Prime Minister also revealed that the government had redesigned its action plan against racism, anti-Semitism and xenophobia and made it "more ambitious." In Italy, a special hotline was launched to protect the victims of anti-Semitic attacks. The hotline, known as the Antenna Anti-Semitism will be accessible by phone and the internet. Renzo Gattegna, president of the Union of Italian Jewish Communities, said that the goal of the hotlines is "to nullify any threat of hatred and discrimination." The hotline was launched with the backing of the Union of Italian Jewish Communities (UCEI) and the Foundation of Jewish Contemporary Documentation of Milan (CDEC). The Service for the Protection of the Jewish community of France (SPCJ) reported a 91 percent increase in anti-Jewish acts during the first seven months of this year. This is an average of more than 2.5 anti-Semitic acts or threats a day. Israeli officials predict that as many as 6,000 Jews will migrate from France this year.